InterMedia published a fantastic report in 2012 about the information environment in North Korea. Here’s a quick highlight of some of the key points, but please read this very informative study! It’s available here. 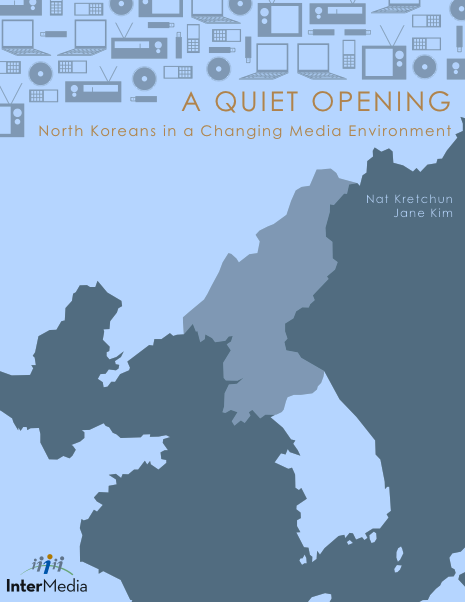 A Quiet Opening is a 2012 study by InterMedia that highlights the changing information environment in North Korea (NK) and assesses levels of access to outside information within NK. It examines the general media environment in NK, focusing on television, DVDs, and radio, and new information technologies such as mobile phones, computers, USB drives, and MP3 players. The report is based on survey data from a 2010 BBG Refugee and Traveler Survey in Yanbian Korean Autonomous Region, PRC (sample size: 250) and a 2011 Recent North Korea Defector Survey (sample size: 420) and subsequent structural equation modeling (SEM) analysis. A key finding is that a strong relationship exists between outside media exposure and positive perceptions held by North Koreans of the outside world. Word of mouth is still the most important source of information in NK. DVDs are the most common and perhaps most impactful form of outside media in NK. Interviews and survey analysis indicate that North Koreans’ specific knowledge and particular beliefs about the outside world are most affected by the relatively greater quantity of information broadcast through outside radio or TV news. South Korean and other foreign films – for entertainment – have much higher production values than NK media because they are seen as credible since they are not propaganda. Korean Chinese and Chinese in Korea play an important role in circulating prohibited goods, particularly DVDs, inside NK. DVD sellers appear to be state officials and wealthy traders since they enjoy some level of protection from law enforcement. Listening to foreign radio is more dangerous than viewing TV or DVDs, but it is the only nationwide source of real-time outside media in NK and the only source of outside news for those unable to receive TV broadcasts from China or South Korea; listeners tend to be more male and somewhat older than audiences of other types of foreign media; most listening occurs at night. A primary reason for listening to foreign radio is to hear about international politics because of economic implications, such as effect on exchange rates and contraband trading. Interviewees believed that those with greater economic means had significantly more access to outside information than those with fewer economic means. North Koreans value new information in radio broadcasts, especially about the NK leadership and ROK. Demand outweighs supply of foreign media. “Fewer citizens appear to be reporting on each other” for watching, listening, and possessing foreign media. This seems to indicate increased trust/reliability among groups of people. SEM analysis of survey data collected from recent NK defectors indicates that those with exposure to outside news or entertainment media are more likely to be favorably disposed toward South Korea and the U.S.
Outside media exposure positively impacts beliefs and attitudes about the outside world. NK authorities appear to “step up” jamming radio signals around significant events. Generally, a strong mix of shortwave (SW) and medium wave (AM) gives a broadcaster the greatest chance of being heard in NK. Maintaining a strong radio presence is of great strategic importance to the ROK and the U.S.
Elites in North Korea: elite listeners rely on radio for hard news and analysis otherwise unavailable in NK; political elite enjoy special status and privileges; enjoy access to more outside information; earliest adopters of new technologies such as computers, USB drives, MP3 players, and mobile phones from China; have ability to secure more energy, purchase luxury goods, including media devices. Less-educated, non-elite, rural North Koreans tend to favor cultural fare and entertainment programs in foreign radio content. Since 2011, there is a domestic mobile phone service operated by Egyptian firm Orascom, but this network is monitored and limited to NK. However, there is a growing illegal network along the Chinese border areas with the use of illegal Chines mobile phones. InterMedia reports that illegal mobile phones have greatly impacted trade, defections, and the general flow of information coming in and going out of NK. Illegal mobile phone use consisted of primarily making calls to China. Interviewees did not send or receive text messages or take pictures or video with their phones. To maintain tighter control, TVs, radios, computers, and tape recorders must be registered with authorities. Telephone lines are wiretapped, and mobile phones must be subscribed at Koryolink offices. Recent developments, such as an internet server in Pyongyang and over 1000 registered “.kp” domain names, indicate NK is developing a more sophisticated internet strategy. SEM analysis: often used to assess the effects of media exposure on behavioral change. SEM analysis of survey data collected from recent North Korean defectors indicates that those with exposure to outside news or entertainment media are more likely to be favorably disposed toward South Korea and the U.S. This confirms that outside media exposure positively impacts beliefs and attitudes about the outside world.